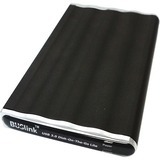 BUSlink USB 3.0 portable hard drive is sleek, light, and quick and easy to install. SSD offers the advantage of faster speed and durability. At the size of 2.5" and weight of only 1.5 lbs, the BUSlink Disk-On-The-Go Lite is so compact - it will fit in your pocket. Plug and play supports quick and easy installation; no separate driver needed. It draws power from the USB bus; it does not require a power adapter. Fast USB 3.0 interface supports transferring files at the speed of up to 5 Gbps. Backward compatibility with USB 2.0 allows connection to most systems. It is perfect for lightweight, fast, and reliable storage solution.